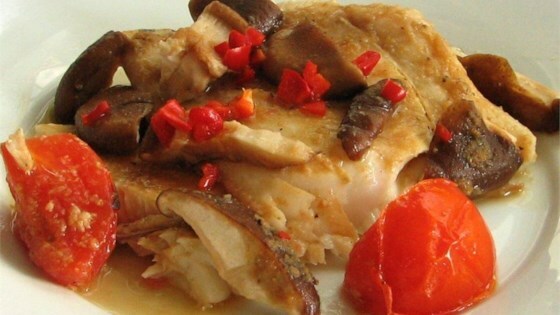 "An easy, fast, and yummy fish dish that my family absolutely loves. This is my mom from China's recipe. Serve with rice." Bring about 1 1/2 inches of water to boil in a steamer fitted with a basket large enough for the snapper to lie flat. Season snapper with salt and pepper, and place in the steamer basket. Top fish with ginger, and drizzle with soy sauce and sesame oil. Place shiitake mushrooms, tomato, and red chile pepper in the steamer basket. Steam fish 15 minutes, or until easily flaked with a fork. Sprinkle with cilantro. Delicious. I skipped the tomatoes but the ginger aroma was heavenly. Very easy to make, i'll definitely make this again. Thanks! very good flavor, the only thing I changed was baking for 35 at 350 degrees my steamer was not big enough. Awesome! Very flavorful, very quick. So little prep time. I was able to get dinner on the table with this dish, rice, and edamame in 30 minutes!